This study examines the types of opioids responsible for rising overdose fatalities in the United States. It finds that despite opioid prescriptions declining since 2010, the number of opioid-involved deaths has accelerated due to staggering growth in overdose fatalities involving heroin and synthetic opioids. Heroin and synthetic opioids drove the increase in opioid-involved deaths after 2010: The annual growth rate of heroin-involved overdose fatalities increased from 4.1 percent before 2010 to 31.2 percent after 2010, while the annual growth rate of synthetic opioid-involved overdose fatalities also increased, from 13.7 percent to 36.5 percent. Transnational criminal organizations have been capitalizing on the nation’s rising opioid dependency by producing and distributing an abundant supply of these illicit and lethal opioids. These findings suggest that combating the opioid epidemic requires a comprehensive approach, as the nation’s significant efforts to curb the availability of prescription opioids may have shifted demand to more potent, illegal opioids. The U.S. opioid epidemic has many negative consequences, including widespread addiction, lower productivity, fewer workers in the labor market, and a number of poor health outcomes. Perhaps most grave is the accelerating increase in opioid-involved overdose fatalities. This study identifies the types of opioids leading to rapidly growing overdose deaths and the reasons behind the growth of each type. Trends in overdose fatalities suggest that growing access to prescription opioids built the foundation of opioid dependency. When policy efforts reduced access to prescription opioids, however, the number of opioid-involved overdose fatalities occurring each year began to grow even faster. Transnational criminal organizations (TCOs) have made illegal and potent opioids, such as heroin and fentanyl, widely available, and opioid users likely turned to these dangerous drugs following greater restrictions on prescription opioids. Thus, while restrictions on prescription opioids appear to have slowed the growth in overdose fatalities involving those substances, the total number of opioid-involved overdose fatalities has accelerated due to staggering growth in overdose deaths involving heroin and synthetic opioids. In 2016, 42,249 people died from an opioid-involved overdose, accounting for roughly two-thirds of all drug overdose fatalities that year. Chart 1 tracks the growth in the total number of drug overdose fatalities and those specifically involving opioids. Overdose fatalities involving any opioid have driven the overall rise in drug overdose fatalities. Between 1999 and 2016, the entire period for which there are overdose fatality data, opioid-involved overdose fatalities grew 10.2 percent annually, while all drug overdose deaths grew at an 8.1 percent rate. After 2010, the quantity of opioids prescribed by doctors steadily declined. Yet, during the same period, the number of overdose fatalities involving opioids accelerated, as illustrated in Table 1. Between 1999 and 2010, opioid-involved overdose fatalities increased 9.1 percent per year. From 2010 to 2016, the growth rate increased to 12.3 percent. This increase coincides with an acceleration in the annual growth rate of all drug overdose fatalities, increasing from 7.8 percent between 1999 and 2010 to 8.8 percent between 2010 and 2016. Furthermore, opioid-involved overdose fatalities as well as all drug overdose fatalities have grown particularly rapidly in the last few years. Annual opioid-involved fatalities grew 15.5 percent in 2015 and 27.7 percent in 2016, while all drug overdose fatalities jumped 11.4 percent and 21.4 percent in those years. Recent research also suggests that the Centers for Disease Control (CDC) may be underestimating the number of fatalities involving opioids. A report published by the Society for the Study of Addiction found that the number of deaths involving opioids each year is 20 percent to 35 percent higher than the CDC estimates. While many argue that the rise in opioid-involved overdose fatalities is tied to poor economic outcomes (e.g. slow job and wage growth), evidence suggests economic conditions only account for a small portion of the increase in overdose deaths. Rather, most of the rise is likely linked to the availability and cost of opioid drugs. In the following, this study examines overdose fatalities involving each of three forms of opioids most commonly involved in overdose fatalities: prescription opioids, heroin, and synthetic opioids. For many years, prescription opioids drove the steady rise in the total number of opioid-involved overdose fatalities. Chart 2 illustrates that the number of prescription opioid-involved overdose deaths occurring each year has steadily risen since 1999. In 2016, 14,487 people died of overdoses involving prescription opioids, accounting for over one-third of opioid-involved overdose fatalities that year. Moreover, between 1999 and 2016, prescription opioid-involved overdose fatalities rose 10.3 percent per year, similar to the 10.2 percent growth rate of all opioid-involved overdose fatalities. The growth in annual prescription opioid-involved overdose fatalities reflects the growth in supply of prescription opioids. Relaxed prescribing practices among doctors and frequent access to pills from family and friends gave those addicted to and abusing opioids a steady supply of them., ,  Overall, the quantity of prescription opioids in the United States has risen considerably over time. Table 2 compares growth in opioids prescribed by doctors to the growth of overdose fatalities involving prescription opioids. Since 1999, morphine milligram equivalent (MME) prescribed per capita, a standardized metric that aggregates all types of prescription opioids, rose 14.3 percent per year, until it peaked at 782 MME per capita in 2010.,  After 2010, the supply of prescription opioids declined 4.3 percent annually, and in 2016 doctors prescribed 599 MME per capita. As the supply of prescription opioids declined, the growth rate of overdose fatalities involving prescription opioids slowed considerably. In particular, between 1999 and 2010, annual prescription opioid-involved fatalities grew at a 13.4 percent annual rate. From 2010 to 2016, prescription-involved fatalities only rose 4.8 percent per year. These trends suggest that the decline in prescription opioids in the 2010s may have slowed the growth of overdose fatalities involving prescription opioids. The most recent data suggest, however, that this slowdown may have only been temporary. Specifically, overdose fatalities involving prescription opioids increased 13.8 percent in 2016, similar to the 13.4 percent annual growth rate that occurred before 2010. These shifts correspond with several major efforts to slow the growth of prescription opioids that started around 2010. First, the Drug Enforcement Administration (DEA) began aggressively investigating actors associated with the epidemic, including wholesale companies that distributed pills to unlawful doctors and pharmacies that gave out pills in exchange for cash. A large part of the DEA effort was aided by the expansion of prescription drug monitoring programs, which track sales of prescription drugs. Second, in 2009, the federal government began implementing the Ryan Haight Act. This made it illegal to distribute controlled substances online and required doctors to see patients in person prior to writing a prescription. Third, in 2010, the American Pain Society as well as the Department of Veterans Affairs and the Department of Defense issued guidelines to encourage doctors to prescribe fewer opioids. Fourth, in 2010 drug manufacturers released a reformulated version of OxyContin (a common prescription opioid) so that it became more difficult to abuse. The decline in the quantity of prescription opioids and the slowdown in the growth of overdose deaths involving prescription opioids suggest that these efforts may have limited the direct negative consequences of these prescription drugs. While prescription-involved fatalities stagnated, growth in the total number of opioid-involved fatalities accelerated. Between 1999 and 2010, the total number of opioid-involved overdose fatalities each year grew 9.2 percent annually, and from 2010 to 2016 the annual growth rate rose to 12.3 percent. If the reduction in prescription opioids slowed the growth of prescription opioid-involved overdose fatalities, how did the overall number of overdose fatalities connected to opioids begin to accelerate? Significant evidence suggests that with few affordable and effective addiction treatment options and a more limited supply of prescription opioids, users likely began turning to the cheaper and more potent illicit opioids as a substitute. The overdose fatality data also indicates this substitution, as overdose fatalities tied to heroin and synthetic opioids have risen rapidly since 2010. The decline in prescription opioids coincides with significant growth in overdose fatalities involving heroin. Heroin is a fairly accessible alternative to prescription opioids, and many with an opioid-use disorder turn to heroin as their tolerance to prescription opioids grows or as it becomes difficult to access prescriptions., ,  A 2013 study found that four out of five new heroin users started by misusing prescription opioids. Given that heroin is already an easily accessible and inexpensive alternative to prescription opioids, the successful efforts to control the growth of prescription opioids has likely driven a large number of users to turn to heroin. Chart 3 adds overdose deaths from heroin to Chart 2. The decline in prescription opioids after 2010 corresponds with a major acceleration in annual heroin-involved overdose fatalities, as Table 3 shows. From 1999 to 2010, overdose deaths involving heroin only rose by 4.1 percent per year. In 2010, 3,036 people died from an overdose involving heroin, while 10,943 died from a prescription opioid-involved overdose. But after 2010, when the supply of prescription opioids began to decline, the number of heroin-involved overdose fatalities grew by 31.2 percent per year. Just five years later in 2015, heroin-involved overdose fatalities surpassed the number of fatalities involving prescription opioids. In 2016, there were 15,469 heroin-involved overdose fatalities, nearly 1,000 more than the number of overdose fatalities linked to prescription opioids. Research suggests that the reformulation of OxyContin in 2010 could be a major factor driving the rise in heroin fatalities, as users began turning to heroin as a substitute. One study found that up to 80 percent of the rise in heroin-involved overdose deaths since 2010 could be due to this change. The tighter restrictions on prescription opioids have also likely led users to synthetic opioids, like fentanyl and carfentanil. Unfortunately, the result has been even more lethal. Fentanyl is 50 to 100 times more potent than morphine and 50 times more potent than heroin, while carfentanil is 100 times more potent than fentanyl. The potency of fentanyl and carfentanil is what makes them very dangerous. Two milligrams of fentanyl is enough to kill an adult and carfentanil was originally made as a tranquilizer for large animals and never intended for human consumption. While fentanyl can be acquired legally via prescription as lozenges, tablets, nasal sprays, or patches, it is the illegally-made pure fentanyl that is becoming a major source of the opioid crisis. With users turning to these drugs, overdose fatalities involving synthetic opioids accelerated even faster than those involving heroin. Chart 4 adds overdose fatalities involving synthetic opioids to Chart 3. As with heroin-associated fatalities, the acceleration in overdose fatalities involving synthetic opioids corresponds to efforts to restrict prescriptions. From 1999 to 2010, synthetic opioid-involved overdose fatalities rose 13.7 percent per year. Between 2010 and 2016, that growth rate jumped to 36.5 percent. Most striking is the rapid growth in overdose fatalities involving synthetic opioids in just the last few years. Between 2013 and 2016, the number of opioid overdose deaths involving synthetic opioids grew 84.2 percent each year. In 2013, 3,105 people died from a synthetic opioid-involved overdose. By 2016, just three years later, overdose deaths linked to synthetic opioids outnumbered those involving heroin and prescription opioids. With 19,413 overdose fatalities in 2016, synthetic opioids are now the largest reason for the recent spike in opioid-involved overdose deaths. How are synthetic opioid-involved fatalities rising even faster than those caused by heroin? One reason is that users often unknowingly ingest them. Synthetic opioids are generally either mixed in with the local heroin supply to increase its potency and value or pressed into pills made to look like prescription opioids or other medication. Consequently, opioid users and non-users alike ingest synthetic opioids when taking what they believe to be pure heroin, prescription opioids, or some other drug entirely. In reality, what they are consuming is mixed with highly dangerous synthetics or just pure synthetic opioids pressed into pill form. Additionally, the practice of mixing synthetics into other substances has expanded beyond heroin, with users and dealers mixing synthetics with stimulants like cocaine. Moreover, synthetic opioids tend to be so potent that anti-overdose medications, such as Narcan, are less effective in countering their effects. Although Narcan has saved many users who overdose on prescription opioids, a synthetic opioid overdose is more difficult to address because it often requires multiple doses of the overdose reversal medication. As a result, advancements in and the greater availability of anti-overdose products have had only limited success in saving those who overdose on synthetic opioids. A major reason behind the growing use of illegal and extremely potent opioids has been TCOs, which are capitalizing on the nation’s growing opioid dependency. With greater restrictions placed on prescription opioids, TCOs have been taking advantage of the unmet demand for opioids by flooding U.S. black markets with heroin and synthetic opioids. Opium poppy cultivation and heroin production often occur in Mexico, which is the primary source of heroin in the United States. TCOs have smuggled heroin and synthetic opioids through crossing points at Mexico’s border with Texas, Arizona, and California. The Sinaloa cartel is responsible for 80 percent of the fentanyl seized by the DEA. Additionally, TCOs have established “cell heads” in cities including New York, Pittsburgh, and Baltimore, which distribute the drugs throughout the United States. Moreover, cartels that did not previously transport heroin into the United States are starting to do so in order to catch up with competitors. Because of the high potency of small doses, synthetic opioids are particularly profitable for TCOs. A single kilogram of fentanyl can result in over $1.5 million in revenue, but only cost between $3,000 and $5,000 to produce. TCOs often manufacture synthetic opioids in China and Mexico and mail them directly to the United States or transport them through Mexico and Canada. With doctors prescribing fewer opioids, prescription rates are going down, reducing the supply of prescription opioids to addicts. This restriction appears to be slowing the growth in the number of overdose fatalities involving prescription opioids. It has also left room for TCOs to turn a substantial profit by taking advantage of those who remain addicted and are turning to heroin and synthetic opioids. Accordingly, overdose fatalities involving those drugs are accelerating, causing the overall number of opioid-involved overdose fatalities to grow faster. This consequence suggests that combating opioid dependency requires a comprehensive approach: continuing to address the supply of legal prescription opioids, but also more effectively treating dependency and cutting off the supply of illicit opioids. “About the U.S. Opioid Epidemic,” U.S. Department of Health and Human Services, March 6, 2018, https://www.hhs.gov/opioids/about-the-epidemic/. CS Florence et al., “The Economic Burden of Prescription Opioid Overdose, Abuse, and Dependence in the United States, 2013,” Medical Care, Volume 54, Number 10, October 2016, https://www.ncbi.nlm.nih.gov/pubmed/27623005. Ben Gitis & Isabel Soto, “The Labor Force and Output Consequences of the Opioid Crisis,” American Action Forum, March 27, 2018, https://www.americanactionforum.org/research/labor-force-output-consequences-opioid-crisis/. See, for example, “Neonatal abstinence syndrome,” MedlinePlus, U.S. National Library of Medicine, National Institutes of Health, April 19, 2016, https://medlineplus.gov/ency/article/007313.htm. “Data Brief 294. Drug Overdose Deaths in the United States, 1999-2016,” Centers for Disease Control and Prevention, https://www.cdc.gov/nchs/data/databriefs/db294_table.pdf. Christopher J. Ruhm, “Corrected US opioid-involved drug poisoning deaths and mortality rates, 1999-2015,” Society for the Study of Addiction, 2018, http://onlinelibrary.wiley.com/doi/10.1111/add.14144/epdf?referrer_access_token=rX4btozD-soy0FjOy-hczota6bR2k8jH0KrdpFOxC67BATtsTJLQd673iPTKf6yPR5aUq6iax31bVbTxKb-Tba35XLMVhsKClqQY_Nz3SJOSq36HjBiVe_CcqtyXvGSlWssMLT1qLFPnNeTnWpB9YtMG8t0e50oTK02UCBxnHj9muR4VpL_K1gSsO1WqvI6NcEZcC_eVhexIjYD2TyE840OqNgqZP30oeRIARl6VjNvdEdlrHrvAq7IivHEo-gTuz6fSbNN2rx5IMolIs6DSZO_ADkUjAULrdUtU8J3g0qUJd-n66e9aaz2ECoIpbyqRxpkwsqujynb3AkeBCDOwa38zp5AWQ9BBjZ9n4Z4IjHoU7M9EvM-5gQCILw2E4428. Christopher J. Ruhm, “Deaths of Despair or Drug Problem?” National Bureau of Economic Research, January 2018, http://www.nber.org/papers/w24188. Thomas A. McLellan and Barbara Turner, “Prescription Opioids, Overdose Deaths, and Physician Responsibility,” JAMA Network, December 10, 2008, https://jamanetwork.com/journals/jama/fullarticle/183032. “Prescribing Data,” Centers For Disease Control and Prevention, https://www.cdc.gov/drugoverdose/data/prescribing.html. 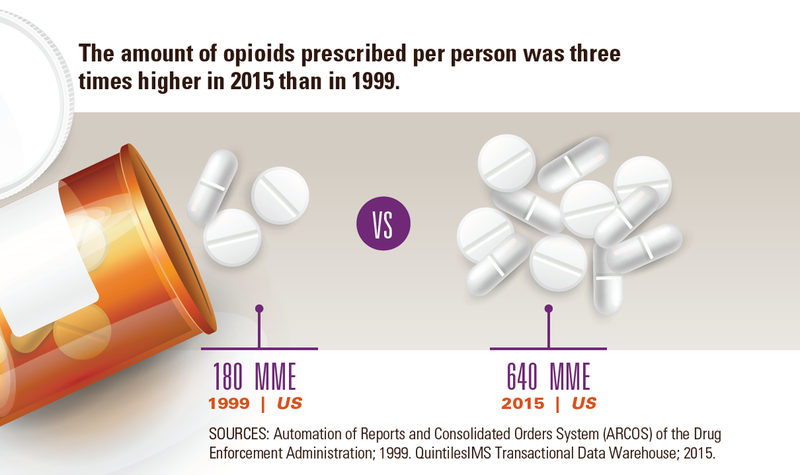 “The amounts of opioids prescribed per person was three times higher in 2015 than in 1999,” Center for Disease Control and Prevention, https://www.cdc.gov/vitalsigns/opioids/images/graphic-a-1185px.png. “Annual Surveillance Report of Drug-Related Risks and Outcomes, United States, 2017,” Center for Disease Control and Prevention, 2017, Supplemental Table 1, p. 75, https://www.cdc.gov/drugoverdose/pdf/pubs/2017-cdc-drug-surveillance-report.pdf. Lenny Bernstein and Scott Higham, “The DEA slowed enforcement while the opioid epidemic grew out of control,” The Washington Post, October 22, 2016, https://www.washingtonpost.com/investigations/the-dea-slowed-enforcement-while-the-opioid-epidemic-grew-out-of-control/2016/10/22/aea2bf8e-7f71-11e6-8d13-d7c704ef9fd9_story.html?utm_term=.9bbd639274de. Abby Alpert, David Powell, and Rosalie Liccardo Pacula, “Supply-Side Drug Policy in the Presence of Substitutes: Evidence from the Introduction of Abuse-Deterrent Opioids,” National Bureau of Economic Research, January 2017, http://www.nber.org/papers/w23031. Garrison Courtney, “New Rules Governing Internet Pharmacies Go Into Effect Next Week,” Drug Enforcement Administration, U.S. Department of Justice, April 13, 2009, https://www.dea.gov/pubs/pressrel/pr041309.html. “Use of Chronic Opioid Therapy in Chronic Non-Cancer Pain: Evidence Review,” The American Pain Society, http://americanpainsociety.org/uploads/education/guidelines/chronic-opioid-therapy-cncp.pdf. “Management of Opioid Therapy and Chronic Pain,” Clinical Practice Guideline, Department of Veterans Affairs and Department of Defense, May 2010, https://www.va.gov/painmanagement/docs/cpg_opioidtherapy_fulltext.pdf. Richard C. Dart, et al., “Trends in Opioid Analgesic Abuse and Mortality in the United States,” New England Journal of Medicine, January 15, 2015, http://www.nejm.org/doi/full/10.1056/NEJMsa1406143. “Medications to Treat Opioid Addiction,” National Institute on Drug Abuse, January 2018, https://www.drugabuse.gov/publications/research-reports/medications-to-treat-opioid-addiction/overview. Theodore J. Cicero et al., “The Changing Face of Heroin Use in the United States,” JAMA Network, July 2014, https://jamanetwork.com/journals/jamapsychiatry/fullarticle/1874575. “How Is Heroin Linked to Prescription Drug Abuse,” National Institute on Drug Abuse, January 2018, https://www.drugabuse.gov/publications/research-reports/heroin/how-heroin-linked-to-prescription-drug-abuse. “The West Virginia Drug Situation,” DEA Intelligence Report, Drug Enforcement Administration, U.S. Department of Justice, May 2017, https://www.dea.gov/docs/DEA-WAS-DIR-024-17%20West%20Virginia%20Drug%20Situation%20-UNCLASSIFIED.pdf. CM Jones, “Heroin use and heroin use risk behaviors among nonmedical users of prescription opioid pain relievers – United States, 2002-2004 and 2008-2010,” Drug Alcohol Depend, September 1, 2013, Epub February 12, 2013, https://www.ncbi.nlm.nih.gov/pubmed/23410617. ”A Briefing Guide for First Responders: Fentanyl,” Drug Enforcement Administration, U.S. Department of Justice, June 2017, https://www.dea.gov/druginfo/Fentanyl_BriefingGuideforFirstResponders_June2017.pdf. “Carfentanil,” PubChem Compound Database, National Center for Biotechnology Information, U.S. National Library of Medicine, National Institutes of Health, https://pubchem.ncbi.nlm.nih.gov/compound/carfentanil#section=Top. “Fentanyl,” Drug Diversion Control Division, Drug Enforcement Administration, U.S. Department of Justice, December 2016, https://www.deadiversion.usdoj.gov/drug_chem_info/fentanyl.pdf. “Emerging Trends and Alerts,” National Institute on Drug Abuse, 2015, https://www.drugabuse.gov/drugs-abuse/emerging-trends-alerts. “Naloxone for Opioid Overdose: Life-Saving Science,” National Institute on Drug Abuse, March 2017, https://www.drugabuse.gov/publications/naloxone-opioid-overdose-life-saving-science/naloxone-opioid-overdose-life-saving-science. “Fentanyl: A Real Threat to Law Enforcement,” Drug Enforcement Administration, U.S. Department of Justice, 2016, https://www.dea.gov/druginfo/DEA%20Targets%20Fentanyl%20%20A%20Real%20Threat%20to%20Law%20Enforcement%20(2016).pdf. “2017 National Drug Threat Assessment,” Drug Enforcement Administration, U.S. Department of Justice, October 2017, https://www.dea.gov/docs/DIR-040-17_2017-NDTA.pdf. “Two Men Sentenced to Prison in Connection with Largest Seizure of Super-Potent Opioid Fentanyl in New Jersey History,” Office of the Attorney General, The State of New Jersey Department of Law and Public Safety, January 26, 2018, http://www.nj.gov/oag/newsreleases18/pr20180126c.html. Christopher Woody, “Mexican heroin is flooding the US and the Sinaloa cartel is steering the flow,” Business Insider, November 18, 2017, http://www.businessinsider.com/sinaloa-cartel-sending-mexican-herion-to-the-us-2017-11. Louis J. Milione, Statement, Drug Enforcement Administration, U.S. Department of Justice, “Fentanyl: The Next Wave of the Opioid Crisis,” Hearing, Subcommittee on Oversight and Investigations, Committee on Energy and Commerce, U.S. House of Representatives, http://docs.house.gov/meetings/IF/IF02/20170321/105739/HHRG-115-IF02-Wstate-MilioneL-20170321.pdf. “Fentanyl FAQs” Drug Enforcement Administration, U.S. Department of Justice, https://www.dea.gov/druginfo/fentanyl-faq.shtml. The decline in labor force participation cumulatively cost the U.S. economy 12.1 billion work hours and $702.1 billion in real output. Women are more likely to be managers in the United States than in the EU.